It's the last day at Bernhardt, and time to head over to plant 4. Plant 4 is an interesting one—only opened a few years ago, it operates under plant 3 (wood) and 7 (seating and upholstery), doing some of the pre-manufactured pieces for both, some of the larger pieces, like conference and task chair assembly. The first thing to notice is that its a much larger and much more modern environemnt than the other plants. Its more of a classic warehouse, which allows for lots of verticle space. Everything that comes into the plant is greeted by the QC department, which inventory everything from vendor, who are spread all over the world. This usually starts with a 10% check, followed by another 10% if it fails—meaning 1 in every 10 boxes pulled. Certain things require a little more observations, so all glass and corian is 100% inspected, to make sure that it meets Bernhardts standards. 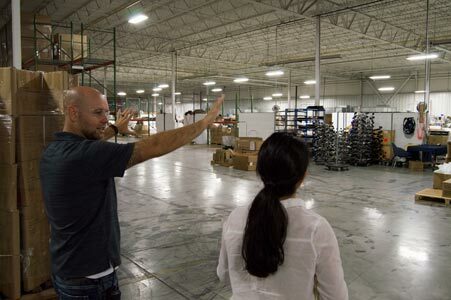 Regarding tracking quality, it starts with a photo inside the receiving truck, to look for damage to pallets from shipping and transport or packing. Once boxes are opened and inspected, the inspectors take photographs of damage and imperfections and record them to allow them to track problems, zeroing in on where the problem lies (with packing or with manufacturing process), and to work on developing processes to improve. Here they are inspecting pretty much every material Bernhardt deals with: corian, glass, veneers, wood, foam, chromed metal parts, all which carry their own characteristics. On one side of plant 4 is the plant 3 side (wood), where a large inventory of stock of furniture which is produced/assembled elsewhere is held. Once ordered, this is then finished (and if it is a conference table, it is uv treated) and either sent through to further assembly, where conference and modular pieces are fitted with brackets and grommets, or straight through to shipping. At this point for conference tables, the hand cut metal extrusions are added, and if customer requests staging to check they will. On the other side of plant 4 is the plant 7 side (seating), where all the task chairs are assembled by hand. This includes foam, upholstery, and assembly, with sewn parts coming from plant 7. This is all followed by standard QC and one in every large order is pulled for testing at the test facility. The packing section was pretty interesting in the sense that, as mentioned before these large surfaces and pieces of wood can get damaged fairly easily as they are pretty heavy. Shipping them can be a pretty big deal and to stop them being dropped in transit but the blame landing at the plant they use these nifty little things called shockdots, which show rough handling. And that was pretty much it, so maybe its time for some final thoughts on Bernhardt design? Well, the obvious things first—they're a huge company, and whilst they seem less corporate, the divisions make things seem pretty red-tapy and confusing from the outside, and they obviously care intensely about design and quality. The weirder things I've caught myself thinking about—a conversation about a more "Southern" design aesthetic in which pieces are part of an environmental aesthetic-pieces combined to greater aesthetic (rather than more loud, individual pieces which scream for attention). Spending longer on the manufacturing floor has also made me think about anther really interesting problem which is larger than one specific company or area and is something which manufacturing as a whole faces, which is to do with skill, experience and age in respect to the available workforce. This is due to many issues: a rising level of education, a reduction in the desire to work in manufacturing, the lowering of the conception of manual labor as a respectable career, through to things like engagement with younger generations at younger ages, drug addiction, draining of communities from rural environments, and even the effect of large stores like Walmart on local communities and economies. Up with the larks to take a look around the Bernhardt plants! Today I was going to look around two of the main plants for Bernhardt design (remember, that's the contract wing of the company). The plan was Plant 7 first—furniture & seating. So the first thing to note here: If you ever drive through Lenoir, you'll see that Bernhardt have a huge number of buildings spread around. They have grown over their history and have access to lots of space—they have actually consolidated and downsized due to technology and changes in production. This has benefits and drawbacks, for example: because the factories are on-site, they are able to deal with problems with product and prototyping incredibly fast and efficient manner. Well here's the bad, the factories have been around for a long time—in fact there is a train track which runs along side a lot of the factories which isn't used any more. That age is shown a little in how the factories are organized. It's not that they aren't organized as well as they can be, but more that no-one who was designing a space for the fabrication the workers are doing these days would design it like that. The buildings are multi-level, back and forth, closed walled, hot and still. It totally makes sense that if its paid for, you have to use it—hopefully at some point in the future they will move to a more well designed building which can help rationalize the process a little. Plant 7 receives the seating frames from plant 5 (woodworking plant which makes frames for whole company)—these are awesome plywood frames. I have to admit I've never taken a pair of scissors/hacksaw to a piece of furniture to see it's skeleton, so the whole creation process was amazing, but seeing the bare-bones really made sense and actually made the forms that you see at the end not look all that hard to produce. Once the frames are sprung and covered, they are sent through to upholstery to have the foam padding and sewn covers added. An interesting little insight (and something which came from our discussion with PD yesterday) was the whether foam bodies of chairs would be injection molded or not. The distinction is if something is thought to be potentially high volume, then this might be injection molded on to a steel or aluminum tube frame. The reason this is interesting is that sometimes they take you by surprise, like the mitt chair which is very popular, but made entirely by hand. Injection molding would mean no need to make a frame and to add the foam to the frame, but obviously plays with the risk that the tooling cost will be repaid. Everyone in the upholstery section is trained to produce every piece of furniture. I'll make a stupid admission here, which is that I was super excited, because I thought I might have captured a hyperloop of this awesome guy making the mitt chair, but it wasn't until over half way through I realized I hadn't pressed record! Urgh! This guy was able to go from the prepared separate parts (frame, cut foam, sewn cover) to the finished piece in 25-30 mins. It was a pretty amazing sight. This is one of the highest skill jobs in the plants, for lots of different reasons. One of them is that they deal a lot with COM (customers own materials), which can be so different to the usual materials applied to the furniture because of factors like stretch, rebound, grain and thickness. This can be such a big issue that they will sometimes reject COM as it cannot live up to the standards which Bernhardt needs it to do—also they don't warranty a COM as they can't promise how it will wear after time. One of the big things I noticed at Bernhardt was the focus on QC (quality control). There is a lot of hand work and craft focus, and obviously that individualization of labor can lead to irregularities (as well as catching scuffs and other fixes which need to be applied to the pieces as they navigate the plants). To help with this, there are many QC checkpoints throughout the factory, as well as little stations at the end of the lines to touch up finishes, and materials. Another important part of this process when thinking about furniture systems is to check modular piece and those which will live together to ensure that every thing is perfect—this means everything from color matching to lining up seams. To help this, those larger modular piece are all staged together, on a physical stage, so they can be thoroughly checked. Talking of color matching, in the finishing section of the plant, they have color boards for customers stored from 50 years. Plant 7 also includes the sewing department, another highly skilled department, which first deals with COMs and adapts patterns to fit furniture (this is done through knowledge, not by pulling it onto a pre-made piece). Moving on to Plant 3—cased goods. I'll make a little admission here, my dad is a carpenter who works with solid lumber and so I've kind of spent my life looking down on veneers as they always seemed low quality and really to not serve any purpose beyond being cheap. Plant 3 deals with veneers and seeing them made in front of me definitely changed my mind about that somewhat. This is a huge facility, with a lot of crazy machines that are pretty fascinating, including one which was like a swiss-army machine which could CNC, saw, apply edge veneers, clean edges and drill. Seeing the process was really enlightening, how the pieces are picked, glued together, applied to a board, edged, sanded, and then finished. A lot of work goes into high quality veneers. Unfortunately the waste can be a bummer—I saw one large piece which was dropped, killing one corner of it, so that piece gets chipped (and then burnt, sad face)... the problem can be that if that piece needed to match the other pieces, or they can't make a satisfactory match with another one, all of them get dumped and everything gets started again. Its Monday morning, and you know what that means... yep, another flight. This time down to North Carolina to spend a few days with Bernhardt design. My knowledge of Bernhardt was limited to some of the more Iconic pieces, like the Orbit by Ross Lovegrove, but I was anxious to get to know the seemingly illusive (from their website) company a bit more. This part of North Carolina (Lenoir) has a long history of manufacturing, and up until recently was somewhere where a large percentage of the furniture produced in the United States came from. As a company, Berhardt started over 100 year ago as a logging company (the countryside here really is beautiful), and eventually moved into manufacturing furniture, making a more traditional style of home furnishings for over 50 years. Then, in the late 80s, early 90's the company moved away from the ornamented peices, into a more modern aesthetic, dabbling in Memphis styled post-modern pieces. In the mid-90's, current creative director Jerry Heling joined Bernhardt, and was one of the key players in taking "Berhardt design" as a contract part of the company (I'll explain this crazy confusing situation in a bit) and started work on creating more modernist pieces which would fit into the business world. With this, the B2B business modernized and became more of what Bernhardt might be more known for in the design community today. Enough with the history lesson—next was a meet with product development. Considering the time spend with companies like Vitra and Herman Miller, it was interesting to meet with a company which also works with designers, but seems to work in a slightly different manner. At Bernhardt, it seems more of the design of the product itself is done in house. It seemed as if the designers Bernhardt works with provide more inspiration for the project rather than full product ideation and conception, and play a more hands off approach over all. As the creative director, Jerry Heling finds the designers to work with on projects, and has the initial relationships with the designers who Bernhardt works with. Interestingly, these interactions with a designer come about through seridipity or spontaneity. Bernhardt prides itself on working with less established designers and getting out into the world to find the undiscovered talent they partner with. The products they produce range from those which are statement pieces and high in cost (which they don't expect to sell lots of), to more safe, high-volume pieces, which can include cased goods also. The small product development team of 5 designers is split between three divisions (residential, contract and hospitality), with only 2 or 3 working on contract designs with ownership of multiple projects out of the 20-40 products released per year. The product development team includes a small highly-skilled team from a few backgrounds (woodworking, upholstery, etc) working on prototypes, which allows them to develop both an aesthetically pleasing product, but also work through production and manufacturing considerations very quickly and efficiently. Like with most interiors companies, their busy time is in the Spring before ICFF and Neocon—where products are revealed at ICFF to create buzz and maybe presages before Neocon, but releases do run on seasonal basis also.